Hose reels give any patio area a clean, streamlined appearance. Instead of leaving hundreds of feet of hose tangled up on the patio to kink and crack in the sunshine, rolling the hose up into the refuge of a hose reel keeps the area tidy while preventing trips and falls. Hose reels maintain the life of the hose itself, preventing kinks from forming that would otherwise cut off the flow of water from the hose. Keeping the hose reeled up can ensure long lasting water pressure. Plus, hoses get wet and messy after use. Reeling a hose into a reel allows its user to rarely have to touch a filthy hose again. Here’s a breakdown of some of the very best hose reels available on the market today. This hose reel from Liberty is the perfect fit for any landscaping need. Its industrial quality withstands any outdoor condition. The enormous barrel on this hose reel holds up to 200 feet of heavy duty hose measuring five-eighths of an inch thick for household use, or 100 to 150 feet of contractor grade rubber hose. No matter how long the hose may be, this reel will keep it neat and tidy when the hose is rolled up. Gardeners with big yards will appreciate this hose reel’s reaching capabilities. Its crank turns in a smooth clockwise motion on its right side for a quick and nearly effortless tightening and unfurling of the hose. The body of this hose reel is made of solid, tank-like 13 gauge steel and arrives with an industrial strength powder coated finish for increased material durability and weather resistance. To give the reel’s powder coated finish lasting life, many customers apply a few coats of Rustoleum paint to its surface, sanding the surface beforehand to give the finish a stronger bond. Unlike plastic hose reels that tend to crack and break with the pull of the hose from its core, or even melt after remaining in the sun too long, the steel body of this hose will hold up through heavy duty use. The heavy duty material on this Liberty hose reel won’t bend or break over time. The fixtures are made of brass and resistant to rust. This model mounts to a wall for sturdy use. Mounting to a wall or concrete pad is the most stable way to use this hose reel. The reel arrives in a neutral tan color that will coordinate with the shade of any exterior wall. The body of the hose reel comes fit with plenty of mounting holes for solid application to any exterior wall surface. Since mounting application onto different surfaces may vary by wall material, Liberty does not include the necessary hardware required for wall mounting with the purchase of this hose reel. However, Liberty includes rubber boots for a non skid floor mount option, making this one of the most versatile hose reel models available for use in any outdoor area. This hose reel also comes with a seven foot leader hose for increased hose stability. Liberty warns that leakage may be possible where the hose connects to the reel. If leakage begins to occur, a quick tightening with a wrench should solve this small issue. When encountering eventual wear and tear through the ages, Liberty has individual parts available for purchase for the repair of this hose reel. There’s no need for a Liberty customer to purchase a brand new hose reel when an individual part gets worn down over time. It’s a lifetime guarantee. The Liberty Garden Hose Reel is the best available on the market today. Available at a reasonable price point, it’s made of the most durable materials available and holds an incredible amount of hose. The wall mount design makes this a sturdy choice, and its materials withstand the outdoor elements. It’s a versatile option for household or industrial use. This wall mount garden hose reel from Eley holds up to 150 feet of garden hose measuring five-eighths of an inch thick. It’s fit with an innovative manual brake that prevents the hose from unwinding itself with its own weight when tightly wound in the body. This feature keeps the hose neat and tidy when not in use, prolonging the life of the hose itself. Made of diecast alloy aluminum, this hose reel is completely indestructible. It measures one-tenth of an inch thick and its aluminum body arrives covered with a bronze powder coat finish that maintains a strong aesthetic against any exterior wall. The reel utilizes a heavy duty brass swivel to turn the hose in multiple directions. The brass material of the swivel is resistant to rust and other types of weather and water damage. An aluminum bracket attaches this hose reel’s tough handle to the reel itself. When it comes to fixture and body materials, this hose reel passes the test with flying colors. The versatile wall mount design of this hose reel can be firmly mounted against any exterior wall in parallel or perpendicular positions. This design is unusual in the world of hose reels, and gives the homeowner or gardener many different options when mounting this hose reel against a conveniently located wall. 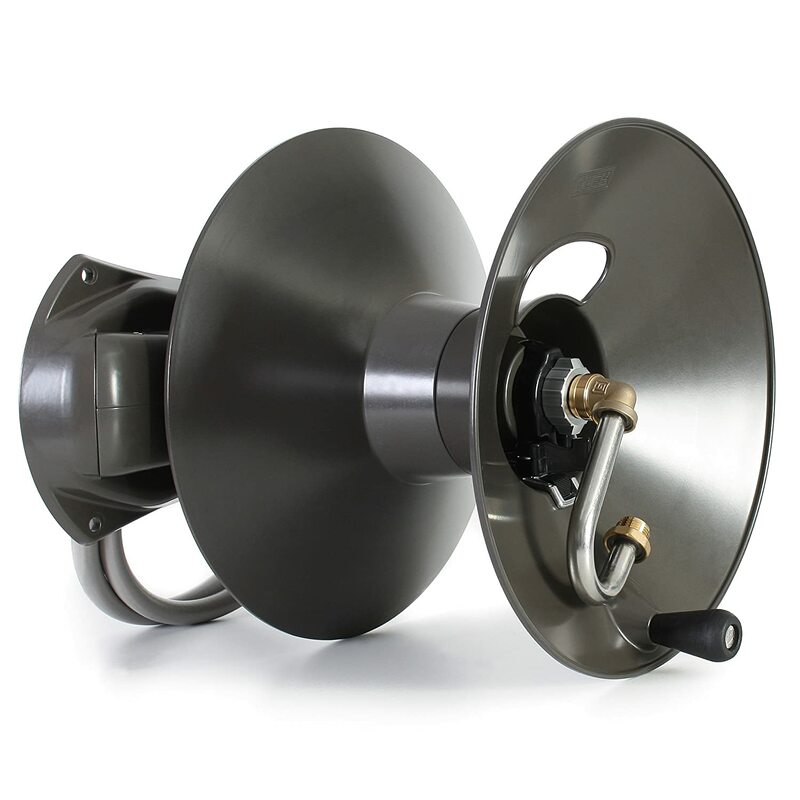 Eley provides the mounting hardware needed to mount this hose reel against any exterior wall near a spigot. 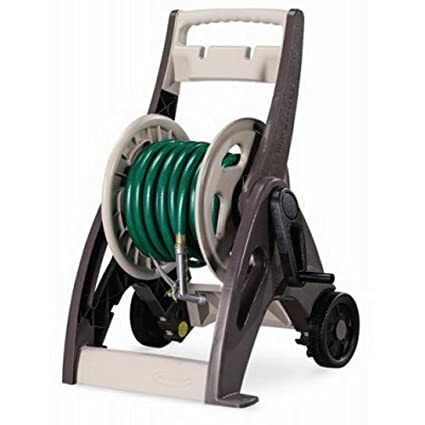 This hose reel arrives with a high quality feeder hose that connects to any garden hose measuring five-eighths of an inch thick. The generous 5 foot long feeder hose is made of tough polyurethane that resists every crack through average, anticipated wear and tear. This reel does not come fit with a hose guide to assist with rewinding the hose. Winding the hose back onto this reel seems like it could be a challenge, but with a little practice, it is not a difficult job to have a beautiful and tidy hose perched upon this reel. Eley provides a ten year all-inclusive warranty with the purchase of this hose reel. If the reel leaks, rusts or breaks within ten years of purchase, Eley will replace the reel free of charge, offering wonderful peace of mind when purchasing this upper-end hose reel. When considering its higher price and prolonged benefits, this hose reel is a true investment. Completely resistant to corrosion, rust and all possible elements, this wall-mount hose reel model from Eley is a terrific long-term option for any home gardener. With its long-term warranty from the manufacturer, this hose reel is determined to withstand the test of time through any conditions. The walls on the sides of the Suncast Hose Hideaway hide the unsightly hose completely while it’s wound up. The cart design stands firmly upright instead of damaging a wall with mounting hardware. The reel holds up to 225 feet of garden hose measuring five-eighths of an inch thick. It also comes with a leader hose that connects the hideaway feature to a nearby water spigot. This heavy duty hose reel will remain standing through wind, rain storms or heavy pulling during use. 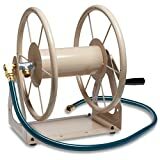 There’s an additional small storage bin conveniently located on the top of this hose reel available for storing watering accessories and garden tools, giving this hose reel one of the most unique designs on the market today. The storage bin is completely removable for easy access to the hose inside. This design makes this hose reel a great choice for smaller patio areas in need of additional storage options. Complete with Smart Trak technology, this hose reel tracks the hose back onto the reel after use, and does so in a neat and tidy fashion. On the size of the hideaway design sits a generous handle that’s easy to turn, bringing the hose onto its reel evenly to ensure few kinks and high water pressure upon the next use. This hose reel is made of sturdy resin that’s resistant to cracks and weather damage. The materials on this reel are sure to last through lots of wear and tear. It arrives in versatile, neutral colors that resist fading and look great in any residential garden. It’s a heavy duty hose reel that sacrifices the industrial, commercial aesthetic that some homeowners find unappealing. 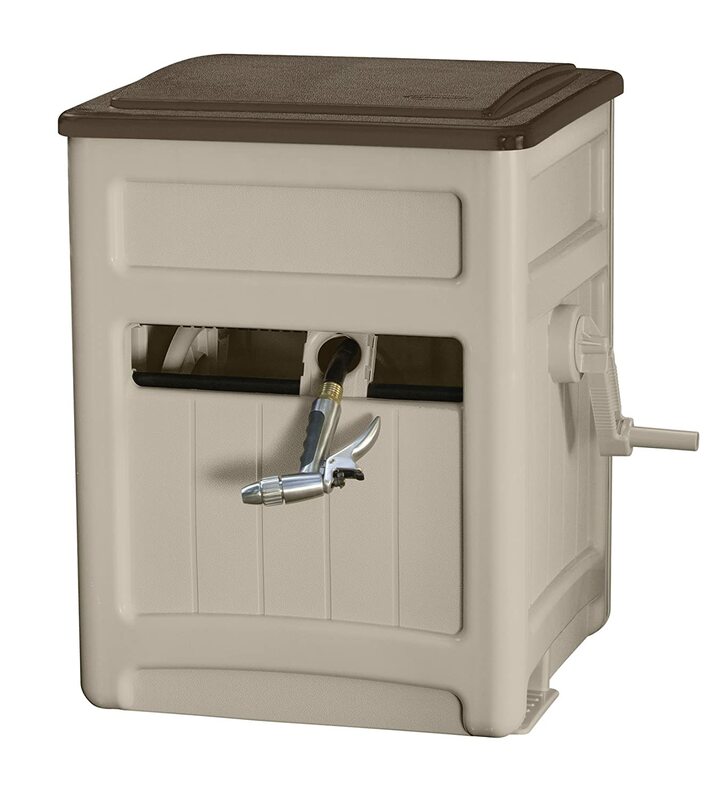 The Suncast Hose Hideaway is a handy design with ample storage for the hose and other gardening tools. Its resin body doesn’t cut down on weather resistance. This is a great hose reel option for any casual home gardener. The hose reel shopper on a budget should consider the Suncast Hosemobile. Its thick plastic body can withstand heavy amounts of sunshine, wind and rain. At one of the lowest prices available, this hose reel is a wise purchase. 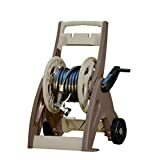 For such a small cart, it’s surprising to learn that this hose reel holds up to 175 feet of garden hose measuring five-eighths of an inch thick. A leader hose that connects to a hose is included, plus special hose hooks that hold the end of the hose securely when reeled in. It has a sturdy, smooth-reeling crank handle on its left side. The Suncast Hosemobile utilizes the Easylink system, ensuring a strong connection between the hose reel and the hose itself. Easylink prevents leaks and kinks in the hose, promising a high pressure blast each time the spigot turns. This hose reel has free flowing motion, allowing it to wind and unwind easily and quickly. This feature assists with unwinding the hose from a distance, allowing it to fall off the reel in a fluid motion. This feature also helps when winding the reel back up, an easy process that takes little to no time at all. The Hosemobile arrives in a dark taupe base color with light taupe accents. The neutral color palette of this hose reel allows the body of it to blend in with any home garden atmosphere. The wheels on this cart model support the easy transport of the hose reel to different parts of the garden, making this model a great choice for gardens with spread-out areas to tend. Since it arrives fully assembled, it’s ready to use immediately. For a cart style hose reel, the Suncast Hosemobile is among the sturdier models on the market. It holds an ample amount of garden hose and looks great near any home. This hose reel is the perfect choice for any gardener looking to try a hose reel for the first time. Every hose reel lists its maximum capacity of hose length. Some manufacturers list that their hoses can hold a whopping 300 feet of garden hose measuring five-eighths of an inch thick. They are telling the truth about this maximum capacity, but at the same time, the manufacturer means to say that this hose reel can hold up to 300 feet of garden hose if the hose winds up flawlessly, without any kinks or errors in the winding process. For this reason, it’s best to purchase a hose reel that leaves room for error in the process of reeling. Kinks happen, and often the hose winds onto the reel a little unevenly. Before shopping for a hose reel, it’s best to measure the hose that will go onto the hose reel. Then, it’s wise to measure up in the shopping process when considering a hose reel’s maximum capacity. For instance, if the hose at hand measures 150 feet long, the shopper should seek a hose that holds 175 to 200 feet of hose. This leaves room for error when guiding the hose onto the reel. There are two main styles of hose reels available today: wall mount and cart. Wall mounted hose reels are the sturdier option of the two. These hose reels go directly onto the side of an exterior wall next to the spigot. They have a tendency to last longer because their materials are thicker for the purpose of the mount. However, some homeowners are not willing to drill holes into the sides of their homes for the sake of a hose reel. Also, wall mount styles are often not an option for renters or apartment dwellers. When shopping for a wall mount style of hose reel, it’s wise to check the number of holes in the reel’s body. The more holes supplied in the hose reel, the sturdier the reel will stand against the wall. What carts lack in sturdiness they make up for in portability. Cart style hose reels are most ideal for gardens that have different areas to tend to. A cart style hose reel’s wheels allow them to move all around the yard or garden area. They’re the perfect temporary solution for any renter or apartment dweller. Due to their wheels, cart style hose reels can get knocked over easily by wind, rain and heavy use, leading to problems with the cart or hose. In areas with heavy pedestrian traffic, cart style hose reels are more likely to be stolen than more permanent wall mount styles. When shopping for a cart style hose reel, it’s best to look for one with bigger, all-terrain wheels that will roll easily over grass and other types of land. Some cart style hose reels are limited to sidewalk rolling due to the small, untextured nature of their wheels. Hose reels arrive in many different materials. The most common difference in materials seen on the market today is aluminum body and plastic body. Though more expensive in price, aluminum hose reels last longer. They can take more of a beating in the elements from sunshine, wind and rain. If the hose pulls tightly around its body from a distance, an aluminum hose reel is less likely to crack or break. Aluminum-bodied hose reels often arrive with a textured paint finish, such as a powder coat, that maintains the life of the hose reel as well. For long-term use, an aluminum body is the wisest choice. When selecting a plastic hose reel model, it’s best to look for one made of sturdy resin. Resin material varieties withstand weather and heat longer than other plastics and are more resistant to cracks and breaks. When kept in the shade, any material of hose reel will last longer. Plastic hose reels require a more gentle touch when using the hose. If the hose remains relatively close to the plastic reel during use to limit pulling on the reel’s body, the plastic will remain intact. Another aspect to consider in any hose reel is the material in which its fixtures arrive. The most ideal material here is rust-resistant brass, which withstands high temperatures and water damage over time. However, brass fixtures also cost a premium in the hose reel market. When shopping for hose reels, it’s best to keep any eye out for fixtures that resist corrosion and rust. Even if the fixtures aren’t made of the ideal brass materials, rust and corrosion resistances are the main factors for which to hunt. It’s also wise to check the hose reel’s crank for sturdiness and long lasting materials when shopping. A hose reel is a wise purchase for any household gardener. With the ability to make a patio area clean and tidy with just the crank of a reel, hose reels are impressive additions to outdoor living spaces. Since reeling in of a hose can keep clumsy and completely preventable trips and falls from occurring, hose reels are especially ideal for households containing children or elderly members. Keeping hoses tidy, they’re a wise investment for the life of a hose, cutting down on kinks and cracks. When a hose gets wet, it picks up dirt from dragging in a garden. A hose reel allows for its user to tidy up the hose without having to touch the wet dirt it collects during the watering process. In the gardening world today, there are many different hose reels available to suit different gardening needs. Finding the perfect one can be a challenge, but when considering the length of the hose, wall mount vs. cart styles, body and fixture materials, it can be a little easier to narrow it down. There are different styles of hose reels available for any household budget.